“It must be left to the painter to convey to the mind the superb coloring,” wrote one journalist of a full eclipse in 1918. The serendipitous passage of the moon directly between the sun and the Earth on August 21 has brought eclipse mania to the U.S. Over the past month, we’ve seen countless visualizations of the phenomenon, from interactive websites to 3D fly-throughs. 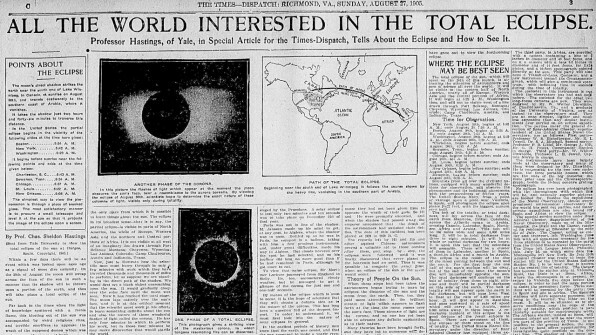 The last time a full eclipse was visible from East to West Coast, it was 1918–and the newspapers of the day applied their own visualization techniques to explain the cosmic event to readers. 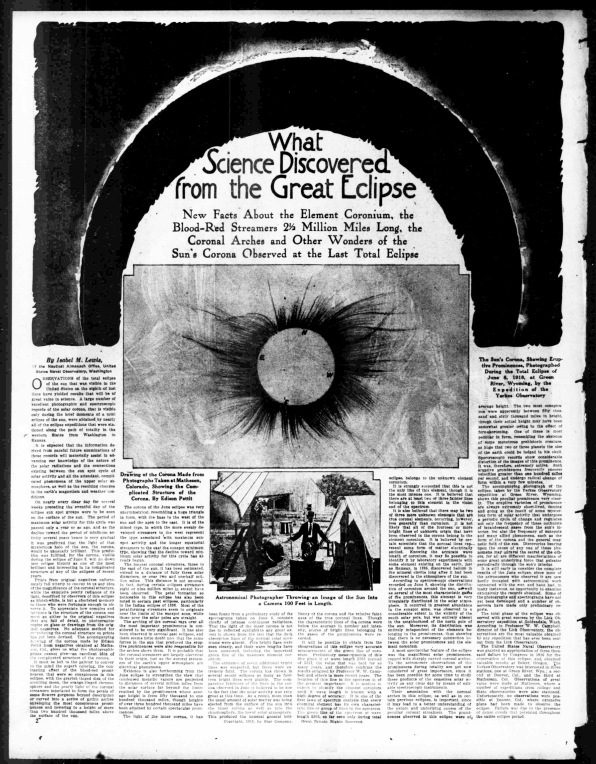 I dug through the archives of the Library of Congress and found many examples of how newspapers depicted eclipses at the turn of the last century. The dataviz of the early 1900s lacks the affordances of today’s interactive, animated graphics, but it also offers a glimpse at how science journalism and visualization have rapidly evolved over the past century. The illustrations also highlight the magic and mystique surrounding this rare astronomical event. When you see the photographs of eclipses printed from this era, it’s no wonder why the Washington Times chose a drawing. 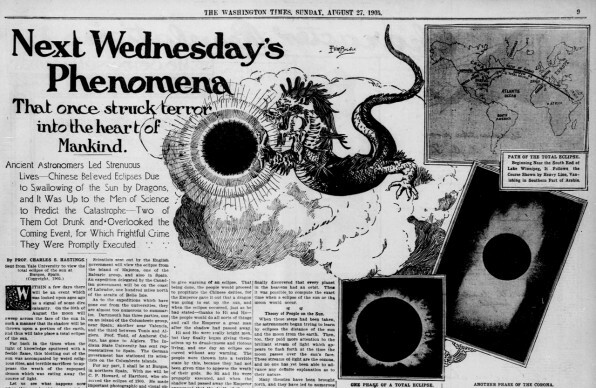 In Richmond, Virginia’s Times Dispatch from 1905, there are two blurry photos that do little to convey the eclipse’s unique emotional power or its scientific value. In contrast, the New York Herald was much more measured with its graphical approach in 1875, showing scientific diagrams laying out how the phenomena occurs. 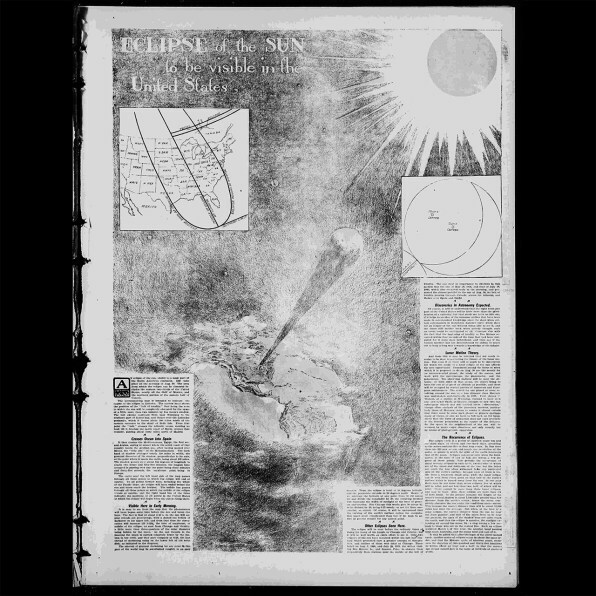 The Omaha Daily Bee from 1905 has a full-page illustration showing the sun, the moon, the Earth, and the beam of shadow caused by the eclipse. Itching to see the eclipse now that you’ve seen these fabulous old-timey graphics? Just don’t forget your glasses. This website produces a GT Metrix Pagespeed score of 99% – That’s blisteringly fast! Here’s an interesting insight into the future of web design.